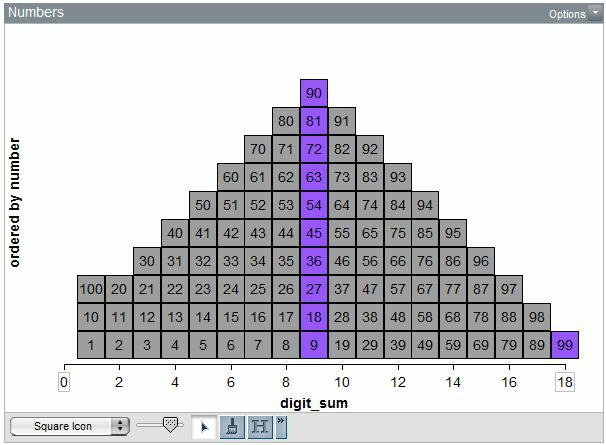 Using these activities and links, your students can understand properties of numbers by analyzing data about them, and can build their data visualization skills at the same time! Every activity comes with a student worksheet and detailed teacher notes, including Common Core State Standards addressed. Students explore the connection between multiplication and division, and between factors and multiples. They use data about the characteristics of numbers to develop number sense and explore multiple representations. Eric Weisstein's MathWorld bills itself as "the web's most extensive math resource." MathWorld's pages on square numbers, triangular numbers, and prime numbers contain lots of interesting information and links, and include content that will appeal to everyone from middle school students to college professors. The MacTutor History of Mathematics, hosted by the University of St. Andrews, Scotland, has a detailed history of prime numbers. The Prime Pages includes lists of prime numbers, brief histories of prime numbers, and an ongoing record of the largest known prime number. Students recognize and generalize patterns in types of counting numbers. Specifically, students will create different arrangements of the numbers from 1 to 100; color all of the square numbers, triangular numbers, or prime numbers; and then describe, explain, and extend the patterns that they see. Students play games in which they are asked to guess a mystery decimal. They complete six games, each of which has a mystery number between two values, attempting to guess the number in as few guesses as possible.